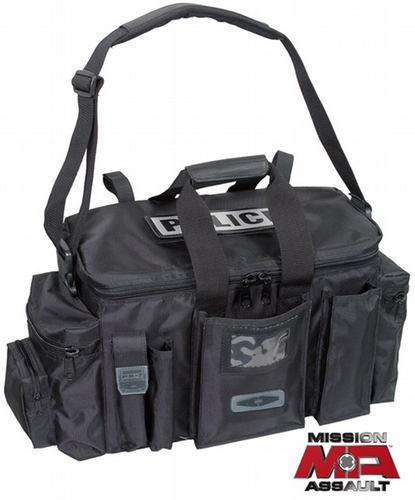 Mission Assault� Patrol Bag � 700 denier water resistant Cordura nylon � Velcro� Flashlight or Baton holder on top � Velcro� Identification Patch on top (sold separately) � 3 heavy duty zippered pouches on ends of bag � Front has expandable baton holder, small flashlight pouch, clipboard and radio holders. � Inside features two zippered pouches and an adjustable divider with rigid bottom. � Removable padded shoulder strap. Dimensions � Total dimensions: 24"L x 9"W x 12"H � Interior Compartment: 17"L x 7 1/2"W x 12"H � Available in black only.